Keynsham residents have helped a local charity win £5,000, with more than 1,100 votes from the community securing the cash. Volunteers and staff at Keynsham & District Mencap Society want to thank everyone who helped them claim second place in the competition run through the Lloyds Banking Group Community Fund Programme. Supporters were asked to vote online or by text message, with four local charities vying for the cash but only the two with most votes receiving funding. Until the last week of the competition, the Keynsham charity was in third place but more than 600 votes in the final few days moved it into second place with 1,176 votes, just 100 more than the third-placed organisation. Funding co-ordinator Helen Bridges said: “Right up until the last week of the competition we were in third place. We received more than 600 votes in the last week of voting thanks to the support of our local press and large local companies such as Andrews, Rotork, Buro Happold and Zurich. The £5,000 will be put towards supporting the clubs for children and young people, which are attended by around 70 youngsters, paying for premises, and funding training and courses for staff and volunteers, from first aid to mini bus driver training. The charity also held a fundraising quiz night on October 5 at Saltford Hall where 20 teams pitted their wits against each other. 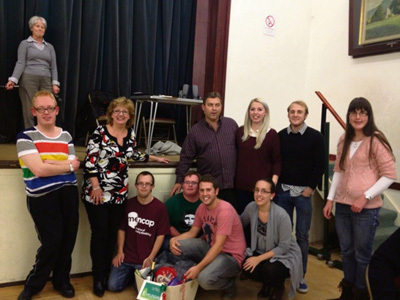 The winning team, Universally Challenged, was presented with a prize basket of wine and chocolates by Hannah, Jon and Barry, members of Keynsham Mencap’s 18+ Club, pictured. All prizes were donated by estate agent Eveleighs.